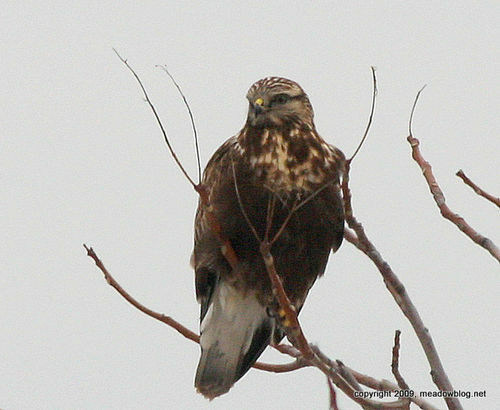 The area by DeKorte Park continues to be Raptorville, with frequent sightings of Rough-legged Hawks (the photo above was taken early Friday afternoon), American Kestrels, Red-Tails, and Northern Harriers. Peregrines, Bald Eagles, a Cooper's Hawk and assorted owls have been seen fairly regularly as well. We saw quite a bit of duck action on the Hackensack River Thursday near the New Jersey Turnpike's eastern spur bridge just south of the Saw Mill Creek Marsh and the Conrail Swing Bridge. 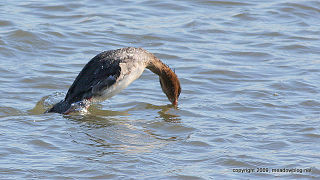 Our favorite performers were female and male Red-breasted Mergansers. These ducks are amazing. We timed the pair of diving ducks when they dived, and they could stay underwater for 35 seconds and more a time in the bone-chilling Hackensack. 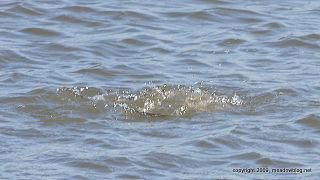 At left, the female takes the plunge. Also on view were several Northern Pintails and Hooded Mergansers. And some very col d Mute Swans were hunkered down on the ice so as to almost appear invisible. 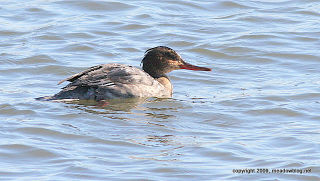 Click here for more info on Red-breasted Mergansers. Click "Continue reading…" for photos of the other other mergansers, pintails and swans..